Ana Lamilla surveys the Renca development from the still-under-construction park on a ridge above. 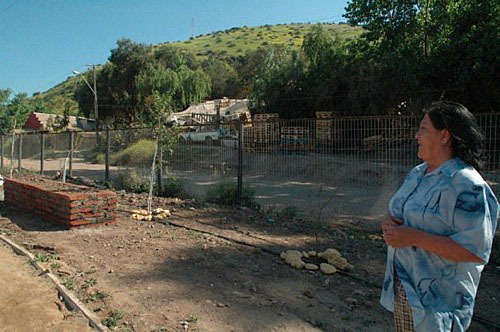 Behind her, part of the squatter settlement where she once lived remains. 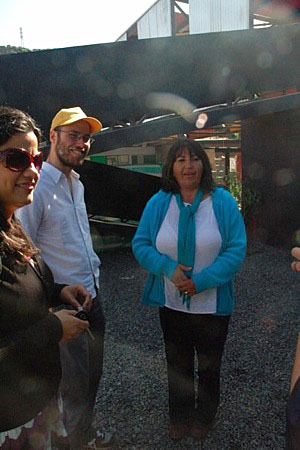 Cecilia Castro (right) talks with Gonzalo Arteaga and another resident of the Renca project. 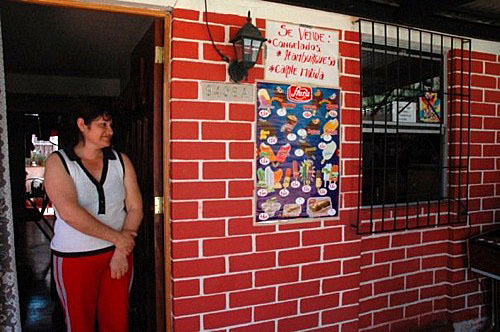 Rosa Estrella Ortega Roa stands in the kitchen of her home in the ELEMENTAL development in Santiago's Renca neighborhood. She moved in just a few months ago, and plans to finish the walls and ceiling. Ortega says even with unfinished walls and plywood overhead, this is a big improvement over her former home in the campamento, which had a muddy dirt floor. 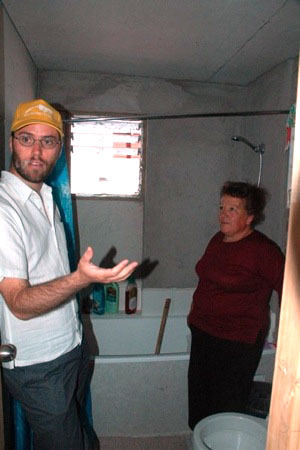 Ortega (right) talks with ELEMENTAL project manager Gonzalo Arteaga in the bathroom of her home. 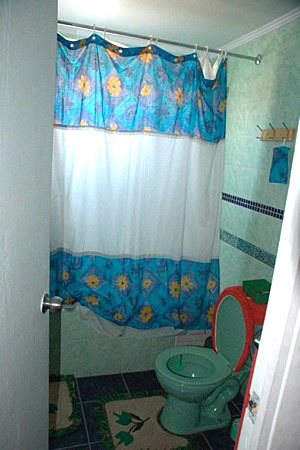 Despite the unfinished walls, residents are pleased that the bathroom in each unit has a bathtub and a window that opens. 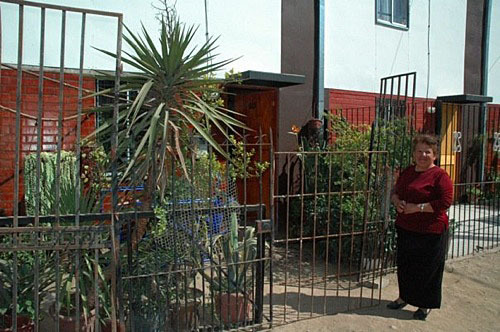 Ortega stands in front of her home. She fenced in her yard and filled it with plants, which she sells to support herself and her two-year-old grandson. 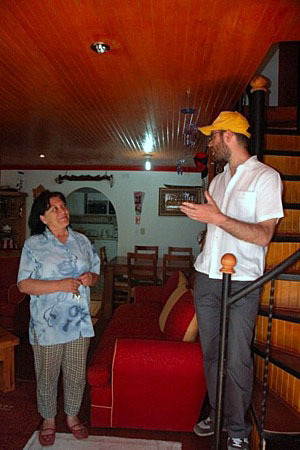 Ana Lamilla, one of the community organizers at the Renca project, talks with Gonzalo Arteaga in the Huertas' living room during a recent tour. Visible in the background is the archway leading into the Huertas' kitchen, which they created by enclosing the backyard. This unit, in its original condition, was identical to Rosa Ortega's; the Huertas finished the walls and ceilings and replaced the staircase. The Huertas' bathroom displays color-coordinated finishings: they replaced the toilet and sink and tiled the walls, floor, and bathtub. The units also had no-frills front yards in their original condition; the Huertas embellished their windows and added a fence, a bench, and an ornamental awning. 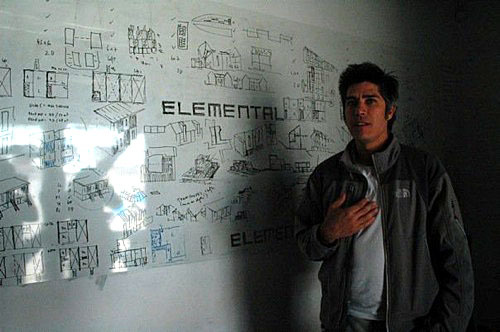 Alejandro Aravena in his office. Herrera stands in the doorway of her home. Joanna Vera’s duplex; the woman pictured is her downstairs neighbor. 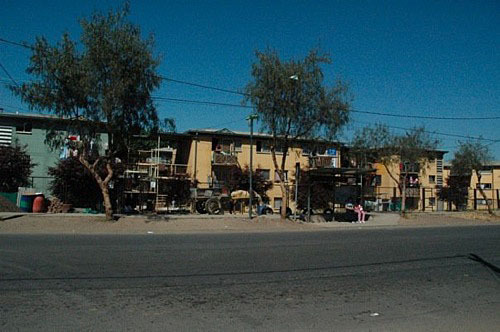 The site of the second phase of the ELEMENTAL development in Lo Espejo, where a shantytown once stood. Even from Santiago’s most impoverished neighborhoods, the majestic Andes are visible in the distance. Santiago, Chile—A young boy plays unsupervised in front of a house that bears a small wooden sign, handwritten in marker: Se venden helados—ice cream for sale. Behind this rather ordinary scene is an extraordinary story with deep Harvard ties. In this tidy development of row houses, 170 families who once lived illegally have become homeowners. Stay-at-home moms feel safe leaving their children in the front yard; some have started small businesses. It is a far cry from the lawless environment of the campamento, or squatter settlement, that sat on the same tract of land until 2004. The development has transformed residents' lives. It is also transforming notions of how to build housing for the poor. Similar developments are built or under way at a dozen other locations in Chile, and there are plans to replicate the project in other countries. In these housing developments, the architecture firm ELEMENTAL departs from common practice in several crucial ways. Their pathbreaking work has won one international architecture award so far. 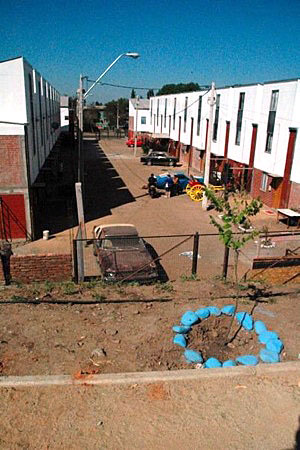 The Graduate School of Design (GSD) and the Santiago office of Harvard's David Rockefeller Center for Latin American Studies (DRCLAS) helped conceptualize an international competition to design very low-cost housing for the poor in Santiago, and provided seed funding. (Winning proposals in the 2003 contest came from Iran, Venezuela, the United States, Uruguay, Spain, the Netherlands, and Chile.) ELEMENTAL, formed around the goal of building a handful of housing developments, has taken on a life of its own and branched out far beyond this initial vision, but Chileans with Harvard connections remain influential. The firm's principals include director Andrés Iacobelli, M.P.A. ’01, and executive director Alejandro Aravena, a professor of architecture at Pontifical Universidad Católica de Chile who was a visiting professor at the GSD from 2000 to 2005. Support from Pablo Allard, M.A.U. ’99, D.Dn. ’01, director of Católica's undergraduate program in cities, landscape, and environmental studies at that university, has also been instrumental. The red-and-white row houses are located in the Renca district, less than half an hour by car from downtown Santiago. Chile is a country that venerates architects, commonly listing their names on buildings' cornerstones; yet, outside Santiago's well-to-do areas, evidence of thoughtful design is all too scarce. Exiting the city center, skyscrapers' shiny glass walls quickly give way to walls around houses, tall enough to obscure fully the homes they protect. Each block is a patchwork of materials: brick next to wrought iron next to opaque plastic. People on horseback share the road with cars. The high housing density of ELEMENTAL's projects allows for purchasing land close to the city center (one development fits 93 units onto 1.2 acres). As a result, residents don't need to move to an outlying site an hour-long commute (or more) away from jobs. They remain in the same neighborhood, with the same neighbors. They don't have to change jobs, find a different bus route to work, or enroll their children in different schools. The government gives a subsidy of $10,000 for each housing unit, an amount that must cover the cost of the land, building materials, and construction. 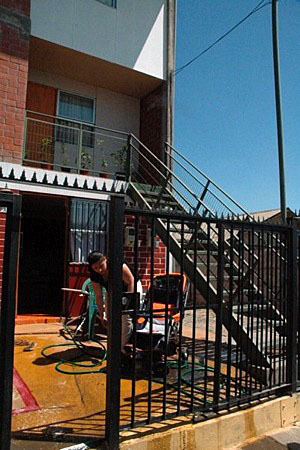 (By way of comparison, the price for a middle-class house in Chile is about $60,000.) 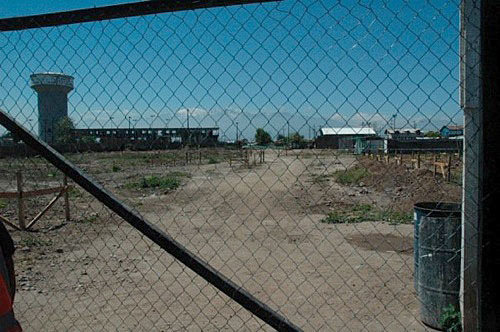 In the case of the Renca site, the developers had their work cut out for them: the campamento bordered on a landfill, so there was polluted soil to scoop up and remove. That soil now sits at the development's edge, where, in the form of a hill capped with a layer of clean soil, it will serve as a park. The residents have planted trees, erected brick barbecue pits, and installed stairs leading from the rows of townhouses up to the park. Their pride in the park shows in the details: at the base of each young tree is a circle of stones, painted a cheerful Smurf-blue. The residents have done all this at their own expense. "Every time we come here, we have surprises," said ELEMENTAL project manager Gonzalo Arteaga on a visit in late October. "The energy is incredible." Working within the limited subsidy ceiling, the ELEMENTAL architects constructed much larger homes than would normally be possible with $10,000, but left the interiors unfinished. 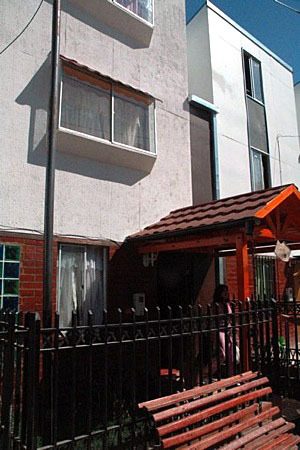 The residents moved into houses with bare concrete floors and plasterboard walls; ELEMENTAL provides the skeleton, and leaves the rest to residents. ELEMENTAL builds the townhouses three stories tall, but fills in only the second floor and the staircase to get there. Residents must complete their own homes' third floors; the firm holds workshops on building structurally sound staircases, floors, and ceilings. (Renca is an exception; ELEMENTAL completed these units' third floors because additional funding became available.) Aravena is fond of saying each unit has "the DNA of a middle-class home." Rosa Estrella Ortega Roa, for one, has big plans for her unit, where she lives with her two-year-old grandson. Already, she has stained the living room's exposed red brick wall a warmer color; she has fenced in her front yard and added a variety of lush plants. (Ortega sells plants, and also gas fireplaces, for a living; an upstairs bedroom holds stacks of the fireplaces in boxes.) Ortega moved in only a few months ago, and most of the walls are still bare concrete. Even so, she says, this is a big improvement over the campamento, where she had lived all of her 58 years. There, her home had a muddy dirt floor. ELEMENTAL considers itself a "do tank," as opposed to a think tank. Instead of discussing and arguing with critics, says Aravena, "we proved our point by building things." 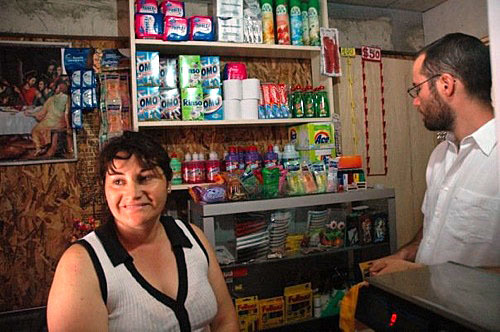 Funded at first by Harvard, Católica, and the Chilean government, ELEMENTAL became a for-profit firm in 2005. Although government subsidies pay for land and materials, private companies, such as Copec, the Chilean oil firm, pay for the architects' professional services as part of their corporate social responsibility programs. The architects supplement their income with projects for private clients. From an initial focus on housing, the firm is branching out to design public spaces such as street markets, a promenade on Cerro San Cristóbal (a hill featuring the world's largest urban park, an attractive space that is nevertheless not as pedestrian-friendly as it could be), and a "flyover" pedestrian walkway to connect two parts of downtown Santiago that are cut off from one another by a busy freeway. "We think cities are a shortcut to equality," explains Aravena. "Without having to wait for income redistribution, we can upgrade quality of life through infrastructure, public spaces, transportation, and, of course, housing." Across town in Lo Espejo—the Santiago metro area's poorest, and most densely populated, district—ELEMENTAL designed a pilot project of 30 units, the first phase of a development that will ultimately house 350 families from a former shantytown. Here, the residents chose a three-floor duplex configuration; one family lives on the top two floors, and another family below, in a larger first-floor unit. (The lower unit's bedrooms are in the rear portion that stretches out from behind the upper two floors, making neighborly harmony more likely.) Units are in various stages of construction, with building materials piled up in some front yards, as owners add finishing touches. Vera was one of the residents who believed strongly in what ELEMENTAL wanted to do; as the project developed, so did her own political voice. She personally negotiated the price with the landowner; during construction, she visited the site every day to monitor progress. After she met the president at the dedication, Bachelet asked her to serve on the committee for Santiago's bicentennial celebration, which will take place in 2010. Vera says most other committee members are far wealthier than she. 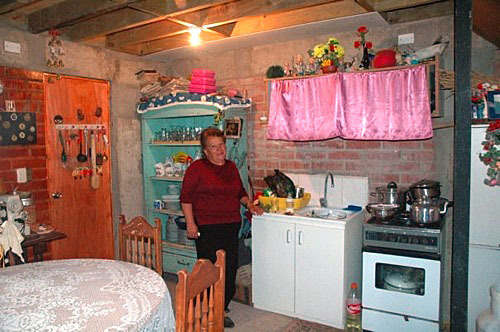 "I represent Chilean poverty," she said with pride. At the dedication ceremony for the Renca development in May, Castro gave a speech. For the first time in her life, she said, she felt proud to be Chilean. One of ELEMENTAL's goals for the project was that the units increase rather than decrease in value over time. They didn't have to wait long to measure their success: the very day they were allowed to move in, some residents received offers of $20,000—double the amount of the subsidy that had built them. But, says Arteaga, nobody accepted. Harvard Magazine associate editor Elizabeth Gudrais traveled to Chile in October to report on projects involving Harvard faculty and alumni. Further reports from her trip will appear online and in future issues of the magazine. To learn more about Harvard in Chile, visit the DRCLAS website or read "Tying Knots," from the May-June 2004 issue of Harvard Magazine. Readers in the Boston/Cambridge area can meet Steve Reifenberg on Tuesday, November 11, at the Harvard Book Store, where he is scheduled to discuss his memoir, Santiago's Children: What I Learned About Life at an Orphanage in Chile, beginning at 7 p.m.